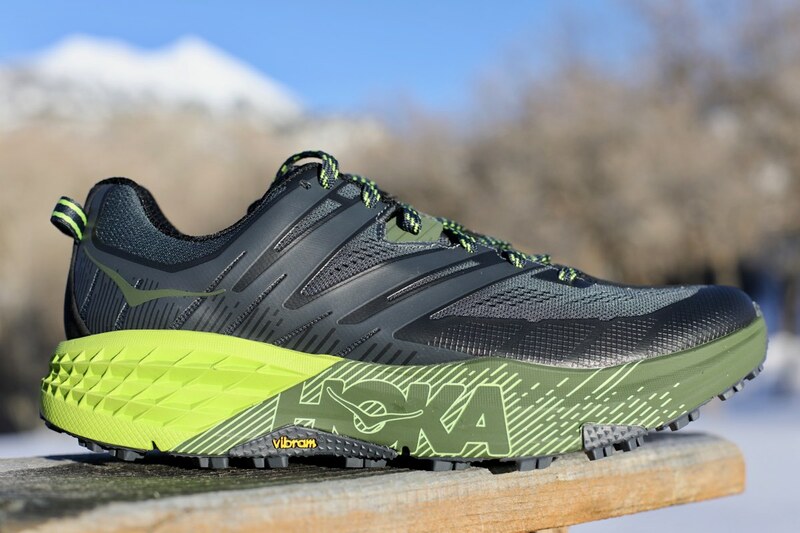 I see the Hoka One One Speedgoat 3 ($140) on a lot of feet these days, including on my local, groomed trails and trudging through the mud and technical terrain of an island in the Pacific Ocean. The Speedgoat has certainly gained a following for its versatility. In this third version of the do-it-all trail shoe, we see only slight tweaks to version two’s formula. The tread and midsole stay exactly the same save for the drop changing from 4.5 to 4mm. For those unfamiliar with this bottom-package combination, this means a maximal shoe with responsive cushioning and a very capable tread pattern built on the Vibram Megagrip compound. The upper sees changes to provide better midfoot lockdown and some more comfort in the toes and heels, at a cost of an extra ounce of shoe. Watch the video to learn more about the Hoka One One Speedgoat 3. Hey and welcome to Trail Trials, and on today’s video we are going to take a look at the Hoka One One Speedgoat 3. This is a 10.3-ounce (men’s size 9) and 9.1-ounce (women’s size 7) shoe. It has a 4mm drop and some updates to the upper. With that information, let’s get into it and see what this shoe is all about. I think the best place to start is on the tread. If you are someone who has worn the Speedgoat 2, if you look at it from the bottom, you wouldn’t be able to tell the difference between the 2 and the 3. To illustrate that, here’s the 2 and here’s the 3 [shows both models]. You can see they are identical or practically identical. You’ve to a little bit [of variation] maybe in the designs here, but for the most part, you’re looking at exactly the same types of lugs, lug depth, and material, which is the Vibram Megagrip. I like this tread pattern. I like this lug depth. I like this compound quite a lot. It works in a variety of different areas. This summer, I wore the Speedgoat 2s crossing half the state of Oregon via the Pacific Crest Trail. I wore Speedgoats on all dry trail, rocky, sandy, and a little bit of everything, and these shoes held up great. In January, I ran a race over in Hawaii, and it was muddy, wet, lots of rocks, and lots of roots, and I think these things did as well as just about anything else I could have worn. The nice thing about that is you just have a really good go-to tread pattern that works well across lots of different types of terrain. I think they’ve done a really nice job with that. 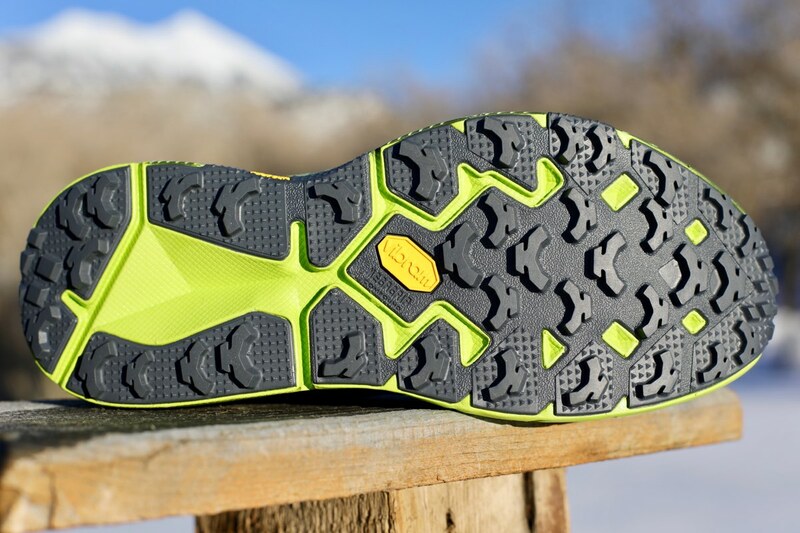 For specifics, you have your uphill lugs here, your downhill lugs in the back for braking—grabs here and grabs there [pointing to the front and back of the outsole]—some various patterns in the middle for varied terrain and those types of things. There are cutouts in the areas where maybe you don’t need a lug because it’s in an area where you’re not toeing off of or braking with that middle part of your heel, so they’ve removed that for weight-saving purposes. The Hoka One One Speedgoat 3 outsole. Let’s switch over to the midsole. The midsole is listed by Hoka as a neutral midsole. There are no other compounds in here or different types of foam with different hardnesses to create a post or anything like that. This is listed as a neutral shoe. In terms of between cushion and hardness, this shoe stops right there in the middle. It’s not overly cushy, and it’s not overly hard. What does that mean? That means it’s not going to be the most cushion you can get from Hoka, but it’s also not the hardest. You’ve got a little bit of responsiveness, and you’ve got a bit of cushion for the long haul, which that’s what this shoe is built for. This is the Speedgoat. It’s named after Karl Meltzer. Karl is the 100-mile guy with a lot of 100-mile wins to his name. That’s the intent here. This is a shoe that is built for comfort, agility, speed, and the best of everything. As we work our way around, you can see it’s a very simple foam. There is no rock plate in here. I will say based off of wearing this shoe a lot and being in varied terrain, from very extreme stuff to regular, the lack of rock plate is not really noticed. I think that’s going to be the case on most maximal-cushioned shoes because it takes a lot for a rock or a thorn or anything like that to poke through the rubber. If it does happen to poke through one of these types of spots, it has a long way to go before it actually gets into the shoe itself. No rock plate, but I don’t really notice it at all. 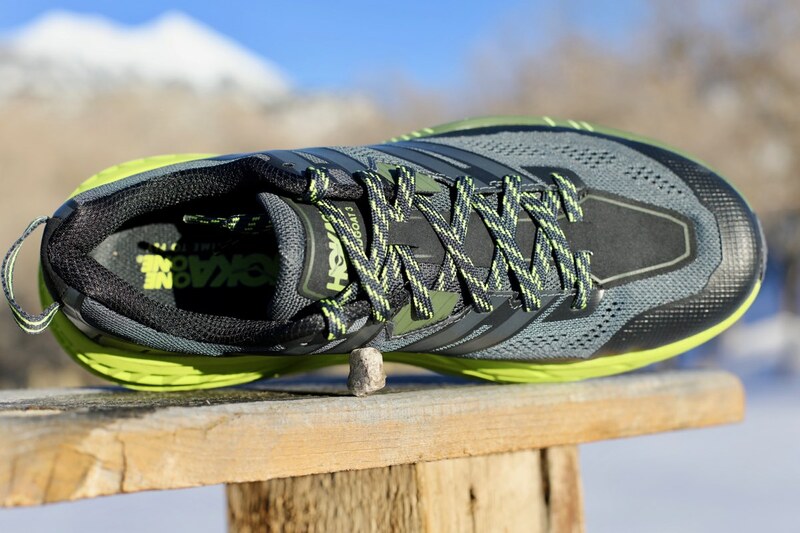 The Hoka One One Speedgoat 3 lateral upper. Where this shoe is really different from the Speedgoat 2 is in the upper. The upper has had, I would say, some nice changes, which is this little area right in here [points to cutout notches in the midfoot part of the upper]. It’s really just these cutouts here. The point is, it really grabs and makes a little better pull onto your foot with a little more midfoot stability. Hoka actually says the difference between the 2 and the 3 is improved midfoot and improved heel. I always liked the 2 and thought the 2 locked down the foot pretty well, but this goes just a little bit farther and gives even a little more snug of a feel to it, which I really like. 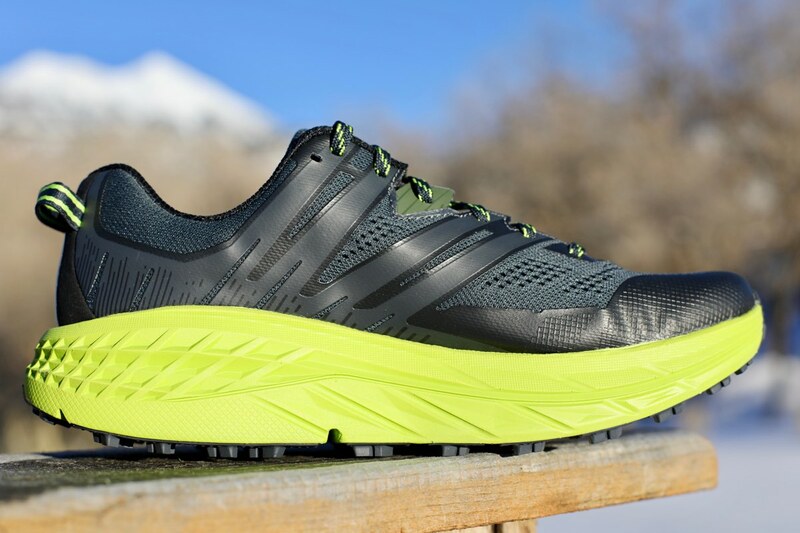 Again, it’s not overly noticeable or an overly tight-fitting shoe compared to the Speedgoat 2, but there is enough refinement to warrant a nice little upgrade. The heel, I don’t really notice a whole lot there. I didn’t have any problems with the heel, but they’ve said the heel has a little bit of a better fit in this version over the other. The place where I struggled with these and where I still continue to struggle is this little piece of fabric right here [points to fabric area in toebox part of upper]. I don’t know why it’s there, and I wish they would take it away. However, there is a little bit more room in this toebox over the last version, just a little bit taller than it was before. But this piece of fabric here, I feel like my toe is always getting caught a little bit on it. It’s really just on my right foot. My left foot doesn’t have it, but all feet are different. My only sort of ding on this shoe is this little thing here. Overall, it’s really good. You can see this rand runs all the way around the shoe does a nice job for mud and keeping gunk from being in there while also creating a bumper to make sure when you’re kicking toes on rocks and stuff you’ve got a little bit of solid material to keep it from coming in. In my previous Speedgoat 2 review, one of the things I noted was that I was having early signs of wear in the very early miles on the shoe. They actually updated that in the second round of color release in the Speedgoat 2 and made a very similar pattern in what we see in this overlay and they removed some of the pinch points that existed before. What I can say in my testing of this shoe to date, which is quite a bit, we aren’t seeing any of that premature wear that I experienced with the last ones. A couple other things I’ll point out here is a slightly refined tongue—a little more smoother and a little wider and wraps around the top of your foot better. It’s still not gusseted, which I wish they would do, but it’s not the case here. So again, it’s a really, really minor update, I would say, to this shoe overall, but it is enough to warrant a nice little upgrade because it does wrap around the foot a little bit better and again, it does—for those who are looking for it–have a little more refinement in the heel and just a bit more room in the toe. The Hoka One One Speedgoat 3 medial upper. In closing, if you liked the Speedgoat 2s, you’ll like the 3s. There isn’t a whole lot that has really been changed here. You have a slightly better-fitting upper. It’s a little more streamlined. You have a little bit better-fitting heel and a little bit more room in the toebox here. If you were someone who were in on the early parts of the Speedgoat 2s before they made the update around the toe and had some of that blowing-out area, this seems to be doing just fine. I wore the Speedgoat 3s for a pretty rough race at the HURT 100 Mile, and they look fine. They survived some pretty nasty conditions there. I’m super pleased. What I would say about this shoe, if you haven’t worn the Speedgoat before, this is a pretty good all-around trail shoe. 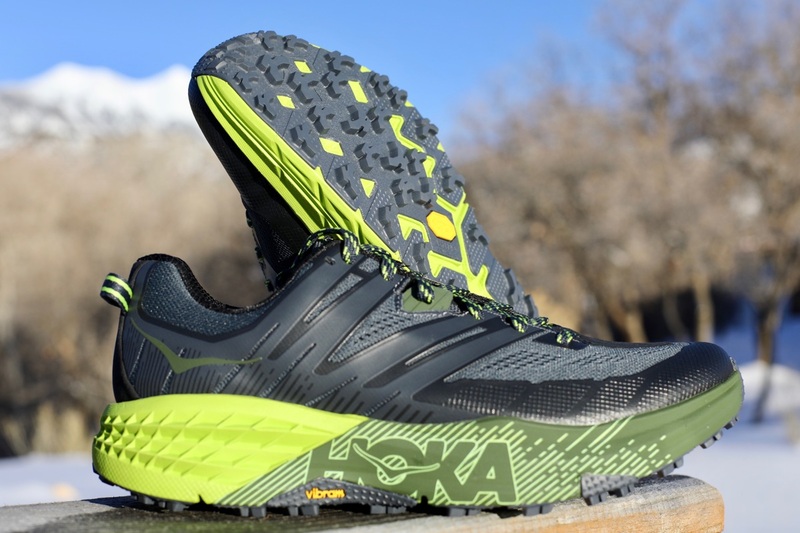 If you want a little bit more cushion, obviously you know what you’re getting into with the Hoka, but this thing does well with a lot of things. I travel a lot for work, and this is the shoe that tends to go with me because it’s not that heavy. The tread and the grip isn’t so deep that it affects running on the road. It works well in technical and rocky conditions. I’ll wear it on the treadmill. It works in a lot of places. That’s why it’s the shoe I generally grab for when I don’t know what I’m getting into. Questions, comments, your own experiences? Leave them below this video. Thanks for watching, and we’ll catch you next time. The Hoka One One Speedgoat 3 view from the top. Still a very narrow shoe for anyone used to what I would call a normal toe box width (nike zoom wildhorse 4, la sportiva akasha, hoka challenger atr 4). I have never tried the speedgoat 2s, but I did like the overall feel of the 3s. They would be a perfect shoe for medium-long distance runs, but they are just so narrow in the toebox. I had difficulty even putting them on initially before I loosened them up as much as they would go. They do widen up a bit after being broken in though. Unfortunately, I still got hot spots on a 20 miler recently. I thought maybe they just needed to be broken in more or the lacing adjusted, but I got hot spots again on a 5 miler after making some adjustments. I guess these shoes just don’t work for me. Overall, I would say that these shoes are fantastic if you can deal with the narrow fit. If you need a little bit more room in the forefoot then definitely try them out first before buying. David, another thing you could try is to pull the insole out and use it without it. Some people do that, to maximize the fit, and to also sink down another 2mm or so into the shoe. Your feet are probably a little wider than a “normal” foot. Whatever that means. :-) Thanks for the nice review. It’s always been an honor to have a shoe named after me. Hoka has done an amazing job with this one, creating just the right amount of cushion for a soft ride that’s responsive. Now go run! I like the Speedgoat2s quite a bit however there’s 2 areas I’m not crazy about: 1) They don’t drain well. I wish more shoes would have trainage ports like the Scott Kinabalus. I feel like there’s water sloshing in my speedgoats for far too long. 2) The tread wears down VERY quickly. I have several pairs of ATR Challengers with 100s more miles and more tread than my speedgoats with ~200 miles on them. Is that related to the Vibram sole? Thanks! Amen! The Speedgoat 2 wrecked my toes, and the 3 doesn’t appear to be any better. And I do not have a wide foot. I wear a normal width in every shoe I’ve ever run in and the Speedgoat is the only shoe that’s ever given me a problem. Sure the toebox is on the narrower side, but it fits my feet just fine. Honestly, I can’t run in these “foot shape” shoes like Altra/Topo etc as I don’t feel secure in them. The Speedgoat 2 has been a workhorse for me and I’m looking forward to the new ones. My first pair got well over 500mi out of them and I found the tread wear to be on par with the Challenger (whereas the ATRs outsold tends to just unglue and fall off WAY prematurely). Small toebox, fits like a size ten, should I have a half size up because I’m running a fifty mile trail ? The SG II, and now III are my go to trail shoes. I was so happy that the III’s were not changed much. I have not noticed the toe box too narrow, I am a women and a size 8 and I found the tread to hold up well for a Hoka. I ventured into wearing the Evo Mafate for a while and do like them but after wearing them at the Speedgoat race this summer I wished I hadn’t, for me they are better for shorter distances, although great grip, I like a bit more cushion. Wore a new pair of Speedgoat III for Run Rabbit Run 100 this year and they were great. 1 pair, 4 sock changes, not 1 blister or hot spot, favorite all around shoe, enough cushion but not a clown shoe and nice support around the heel/ankle. Those of you on here crying about a ‘narrow’ toebox have apparently never worn any truly narrow shoes or have hobbit feet. Stop trying to change this shoe, go find a shoe that fits your foot. If I got a pair of Speedgoat’s every time someone lead in with “narrow toebox!” I would have a room full of SG’s in my house (which would be AMAZING). The speedgoat’s do NOT have a narrow toebox by any stretch of the imagination. I just wore my SG2’s for 100 miles straight at Umstead without changing socks or taking the shoes off and they performed amazingly. I had ZERO issues with my feet. Go wear Altra’s, go wear Topo’s, or go wear Huraches, if you want a wide toebox. I hate the footshapes of all of those shoes I just mentioned but I’m not on their reviews or manufacturer’s sites begging for changes to their design!